Since the 1930s optical astronomers had been making regular observations of solar flares – sudden and violent explosions in the atmosphere of the sun that occur on the average once every half-hour or so and which are the most powerful form of explosion in our solar system. It was known that these large optical flares were accompanied by intense but short-lived bursts of radio emission over a range of wavelengths. Beginning as early as 1944, scientists at CSIR’s Division of Radiophysics made outstanding contributions to this field. Ruby Payne-Scott and Joseph Pawsey carried out an initial radio astronomy experiment in March 1944 from the Madsen Building on the Sydney University grounds and in 1945, Payne-Scott carried out some of the key early solar radio astronomy observations at Dover Heights (Sydney). In the years 1945 to 1947, Payne-Scott and colleagues discovered three of the five categories of solar bursts originating in the solar corona and made major contributions to the techniques of radio astronomy. Subsequently in only 12 weeks of 1949, from a makeshift observatory at Penrith at the foot of the Blue Mountains, Paul Wild using the world’s first radio-spectrograph, identified, classified and interpreted the different types of bursts of radio emission received from the sun. His classifications became the internationally accepted standards. Over the next decade Paul Wild and his colleagues revolutionised our understanding of the sun. Discoveries were made about magnetic storms and space weather, and the fastest particles in the Solar System were revealed. Nothing remains of his equipment today and it has been forgotten by all but a few, but fifty years ago the world’s best solar science was done at a Dapto dairy. These observations were followed over the next two decades by major discoveries using better instrumentation such as the dynamic radio-spectrograph during the 1950s and the radiohelograph which was commissioned in 1967. The latter enabled the gigantic Type IV solar bursts to be observed, where gigantic magnetic arches filled with charged particles can be seen expanding to sizes greater than the sun itself; and in which clouds of gas can be seen hurled out from the sun to distances of as much as two million kilometres. This work has contributed not only to a deeper understanding of the sun and the solar explosions which cause widespread effects on the Earth and throughout the solar system but also to the general subject of plasma (ionised gas) physics. With the flow of new discoveries from a brand-new science a special atmosphere developed – perhaps, though on a smaller scale, something like that at ‘the Cavendish Laboratory in Rutherford’s time’ (when the famous physicist was opening up the whole field of nuclear discovery). The new science of radio astronomy had a nervous beginning. On several successive days in February 1942 a new and unidentified noise confused reception by radar sets throughout Britain. At first radar operators feared the Germans were launching a massive bomber attack and then, when no aircraft appeared, that the Germans had found a means of effectively jamming Britain’s warning system. After the war, when radar came off the secret list, it was revealed that an English physicist had identified the radio noise as coming from the sun. At that time the CSIR Radiophysics Laboratory in Sydney was being reorganised by its new Chief, Dr EG (Taffy) Bowen. The Radiophysics Division, which had been set up just to do work on radar, faced a real crisis. They had all of these highly trained young physicists but the radar research program was going to be shut down on the grounds that no one was really going to need it given the war was over. So the team put in a bid to the CSIR to get funding to remain a radiophysics research division that would be concentrated in two different research areas. One was to be rain making and research on cloud seeding. The other was to be radio astronomy. To its eternal credit, the CSIRO agreed to fund this Division and this research project and that meant that Australia became an international leader in a completely new field, which is almost unprecedented in its scientific history. There was only one other team working and that was in England and they were hampered by other research difficulties. So Australia really was the No 1 spot in the world to do that kind of research. It was immensely exciting. So once they’d started, every day they found something new. Dr Joseph Pawsey, the CSIR Laboratory’s most outstanding physicist, was appointed to head the astronomy group and immediately hired Ruby Payne-Scott as a permanent, full-time scientist. Payne-Scott provided much of the initial scientific leadership in the years 1945-48. Pawsey seized on the report of radio noise from the sun. With Payne-Scott and colleagues he moved into the old wartime radar stations around Sydney – on the ocean cliffs at Collaroy, North Head and Dover Heights – and with some quickly assembled equipment began listening for the sun. Within a week or two they detected the solar radiation and found it to be highly variable. Daily measurements over the next three weeks showed that the intensity of the radiation varied according to sunspot activity. The next important step was made three months later when Pawsey and his colleagues demonstrated that the emissions came from the region of sunspots. To pinpoint the source of radio waves so accurately was beyond the capacity of the aerials then available. However, the aerial of each radar station was located on high cliffs and Pawsey realised that as the sun rose slowly above the horizon, the recorded signal would show interference as a result of solar radiation received direct from the sun. The first observations, made on 6-9 February 1946, were dramatically successful and pioneered the application of interferometry to radio astronomy. In the following year Pawsey showed that, even when there were no sunspots, the ‘quiet’ sun sent out a steady stream of radio waves emitted from its 1 000 000 °C outer atmosphere – the corona. Through a loudspeaker they sounded like a steady blast of wind. This pioneering research showed that the solar bursts had a size much less than the solar disk and that the bursts originated in areas close to and associated with large sunspots. The concept of Fourier synthesis was proposed for the first time by Pawsey, Payne-Scott and McCready based on the use of the ‘sea-cliff interferometer’ at Dover Heights. Payne-Scott derived the mathematical formulation for this breakthrough; her maths skills had been fully developed during the war-time radar research. Based on the huge solar outburst of 8 March 1947 (possibly the most intense radio astronomy signal ever observed), Payne-Scott participated in the discovery of the solar flare related Type II bursts. In 1948, Payne-Scott spent a year at the Radiophysics field station at Hornsby studying the Type I and Type III solar bursts where she was assisted by Marie Coutts Clark. Since the 1930s optical astronomers had been making regular observations of solar flares – sudden and violent explosions in the atmosphere of the sun that occur on the average once every half-hour or so. Flares are the most powerful form of explosion in our solar system. A very large flare – such as may occur once every few years – releases as much energy as 20 million IOU-megaton H-bombs all detonated at the same time. Even before 1947 it was known that large optical flares on the sun were accompanied by intense but short-lived bursts of radio emission over a range of wavelengths. The observations of Pawsey’s colleagues, Ruby Payne-Scott, Don Yabsley and John Bolton, of the great outburst at Dover Heights using three aerials tuned to different frequencies showed that the outbursts began at quite different times according to frequency, high frequencies before low, suggesting that the source of radiation moved outwards through the solar atmosphere. Perhaps the most remarkable set of radio astronomical observations lead by Payne-Scott was the design, construction and use of the ‘swept lobe’ interferometer at 97 MHz constructed at the edge of Potts Hill Reservoir in 1948-49. The data obtained in 1949-51 enabled Payne-Scott and Alec G Little to image the sun 25 times a second; thus a movie was constructed that allowed the observer to follow the time evolution of the solar outbursts of Type IV. The angular motions and thus speeds of the emitting matter in the solar corona were determined directly for the first time by solar radio astronomers. These results were one of the highlights at the Union of Radio Science international congress in Sydney in August 1952, the first international science meeting to be held outside of Europe and North America. Stimulated by the observations of Pawsey, Payne-Scott, Yabsley and Bolton, Paul Wild set to work developing the world’s first radio-spectrograph. This instrument scanned rapidly across the frequency range 70 to 130 megahertz, producing a spectrum of frequencies every half-second and displaying it on a cathode-ray tube. It was the first instrument in the world able to detect the range of wavelengths contained in solar bursts – the brief blasts of radio energy that had been detected at Dover heights. Paul Wild set up the spectrograph near the Penrith railway station in 1949. It was an unlovely apparatus with an unwieldy diamond-shaped aerial of wood and wire which had to be pulled around every 20 minutes by ropes attached to a winch. The aerial was wired to recording equipment housed in three decrepit mobile trailers where the scientists took pictures with a hand-cranked movie camera. He and a technician used to travel by train to Penrith every day armed only with a hand-cranked movie camera with which to film the spectrograph output on a cathode ray tube showing intensity versus frequency. After filming the signals for months the two researchers began to analyse their data. They identified three types of solar burst: Type I, Type II and Type III of the now-accepted international standard. He knew from previous work in ionospheric physics that the sun’s corona was something like the shells of an onion, each shell with its own resonant radio frequency, the highest frequency shells being closest to the sun and the lowest, the most distant from it. The spectrograph measured the resonant frequency of the bursts and so was able to identify the height of the source of radiation in the sun’s atmosphere at any instant. In certain types of burst (Type II and Type III) a remarkably distinctive pattern shows up in the recorded spectra: the events first appear only at the highest frequencies, then steadily drift down the spectrum and disappear off the low-frequency end. This means that the source of radiation begins low in the sun’s atmosphere and moves progressively outwards. By measuring the rate of frequency drift it was possible to calculate the outward speed. The Type III burst is a common short-lived event, a radio ‘flash’ lasting only a few seconds. In a week of intense activity there may be 100 flashes. Paul Wild inferred from his observations that these flashes move at about 100 000 kilometres per second (one-third the speed of light), sending electron particles racing across the gulf of 149 million kilometres to Earth in only half an hour. Years later, satellite observations confirmed this inference. Type II bursts are bigger still and happen only three or four times a month. They are caused by a shock wave moving at about 1 000 kilometres per second to reach Earth 1½ to 2 days later, causing brilliant aurora light displays in the northern and southern skies and great magnetic storms. Type I, although very common, is not really a burst but a complex and stationary solar storm that hovers above sunspots. The wooden rhombic aerials were built by our carpenters … inside the observing hut there was a mass of wires, moving parts, a great deal of switchery, clatter of noise and a weird collection of improvised equipment. But to some extent those were the days. At first the sun refused to cooperate and for four months a lull in sunspots forced the team to wait, disheartened, despondent and wondering if their new equipment really would work. Then on one memorable day a new group of sunspots appeared and the spectrograph produced a beautiful record of a Type II burst that showed a new effect destined to play a vital part in the emerging field. The principal burst, appearing on the record graph as an elegant boomerang shape, was accompanied by what appeared to be a duplication of its own image but shifted in frequency. The astronomers set to work analysing these pairs of images and found their frequency had an exact relationship of two to one. They deduced that harmonic resonance was taking place in the electrically charged ionised gases of the plasma surrounding the sun and this provided the clue to the physical mechanism responsible for the radiation. Shortly after, they found the same effect with Type III bursts. This is how they pictured it: when a shock wave (in the case of Type II) or a cloud of electrons (in the case of Type III) is shot out from the sun it excites the plasma into resonant oscillation and, as it passes through each different frequency shell, the plasma oscillations there transmit radio waves of that frequency – and of its harmonic. As the disturbance reaches the outer and less dense plasma the frequencies get lower. This discovery triggered off a whole new field of activity in plasma physics which was eventually formulated by two Russian physicists in the theory of combination scattering. This explains how one wave can scatter on another wave producing a second harmonic. By the early sixties solar science had moved on, radio interference from nearby heavy industry was increasing, and the Division of Radiophysics had plans for a bigger and better observatory. 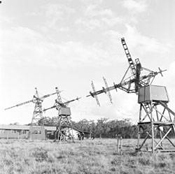 On March 1, 1965 the Dapto solar observatory was officially handed over to the then Wollongong University College and in 1967 CSIRO completed construction of a modern radioheliograph at Culgoora in country NSW (see below). The University moved Wild’s equipment to another site where it was used for teaching until vandalism and neglect rendered it useless. After years of brilliant science, the world’s first solar spectrographic observatory was broken apart and sold for scrap. The work at Dapto lasted from 1952 to 1963 when it became obvious that CSIRO’s solar radio astronomers would have to take the step into ‘big science’ if valuable work were to continue. One of Pawsey’s final achievements with CSIRO was to persuade the Ford Foundation of America to grant the US$630 000 needed for a radioheliograph – a unique radio telescope designed by Paul Wild and his colleagues which records two-dimensional images of the sun in the ‘light’ of radio waves. A fresh radio image is produced each second. Sited at the CSIRO Solar Observatory at Culgoora, 480 kilometres northwest of Sydney, the radioheliograph received its first message from the sun in August 1967. The radioheliograph has 96 aerials in a 9-kilometre circle. Each aerial is 13 metres across and linked to a central receiving station which effectively performs like one huge dish, 3 kilometres wide. It enabled the astronomers to record moving pictures of solar disturbances taking place in the solar corona – disturbances that are quite invisible with optical telescopes. Aware that sunspots are regions of intense magnetic field, with each pair of sunspots acting like the poles of a magnet, the astronomers designed the Culgoora radioheliograph so that it would record oppositely polarised radiation on twin filtered cathode-ray tubes. Left-handed polarisation, directed outwards from the sun, shows red whereas right-handed polarisation, directed inwards, shows blue. With the two images superimposed, unpolarised radiation shows white. With this refined equipment the astronomers were able to ‘see’ what is happening on the sun instead of just observing the effects. They could see a Type III burst as a small but very ‘bright’ patch as the pulse of high-speed electrons pierces the coronal shells corresponding to the frequencies to which the radioheliograph is tuned (43, 80, 160 and 327 megahertz). These shells lie respectively at heights of 700, 400, 200 and 70 thousand kilometres above the sun’s surface. A Type II burst could be seen as a series of great extended arcs as the shock wave from a solar explosion passes through successive shells. But by far the most dramatic events to be seen by the radioheliograph belong to another class (Type IV) in which gigantic magnetic arches filled with charged particles could be seen expanding to sizes greater than the sun itself; and in which clouds of gas could be seen hurled out from the sun to distances of as much as two million kilometres. The science conducted at Dapto laid the foundations for investigations of solar plasmas through to the present day, but the Dapto observatory was known for more than its science. It contributed not only to a deeper understanding of the sun and the solar explosions which cause widespread effects on the Earth and throughout the solar system but also to the general subject of plasma (ionised gas) physics. To the solar astronomer the sun’s atmosphere is effectively a laboratory for studying very hot, large-scale low-density plasma – a laboratory in which a whole new world is revealed of strange phenomena which do not occur on Earth, and yet the observations made in this CSIRO laboratory could in time hold the key to the eventual harnessing of thermonuclear power. The importance of the work done by Paul Wild and his team at Dapto was internationally recognised. In the debate about what sort of instrument to make after Dapto, given that the bulk of the budget was going to a massive new radio telescope at Parkes, Wild won the day, and the Culgoora Radio Heliograph was built to his design. The Culgoora Solar Observatory was operational from 1967 until it closed in 1984 when a new instrument – the Australia Telescope Compact Array – was built at the Culgoorah site. This instrument is now known as the Paul Wild Observatory. Many of the heliograph dishes are still standing on the site and the visitor centre includes the history of the solar heliograph and a commemorative tablet for Paul Wild. Wild’s talents were obvious and he was rapidly promoted through the ranks. By 1971 he was Chief of the Division of Radiophysics, and in 1978 was made Chairman of the CSIRO, which post he held for seven years. McKay A, 1976, ‘Explosions on the sun’, In: Surprise and Enterprise, Fifty Years of Science for Australia, White F, Kimpton D (eds), CSIRO Publishing, pp.30-32. Goss WM, McGee RX, 2009, Under the Radar: The First Women Radio Astronomer, Ruby Payne-Scott, Springer Series: Astronomy and Space Science Library, Butler Burton (ed).